Description: Wholesale freshwater pearls, sea water pearls, natural stones and crystals. Comments: Let fantasy be your guide. For pennies, you can design jewelry to your heart's content. Every vendor will have loads of ready-made jewelry for you to look over but you can also design your own. Just wait a few minutes and they'll string everything for you as you watch. Remember the golden rule: bargain, bargain, bargain! Description: Same type of market as #2, but much bigger. Comments: The market is a little out of the way for the normal tourist who is staying downtown, but if you have time (hey, they're open until 10pm), make the trip out. Like Pearl's Circles, vendors have ready-made items for you to buy, but you can do your own designing. Freshwater pearls are a real value in China. Read more about buying pearls in China here. Description: Underground (literally) maze of vendors selling toys, clothing, jewelry and a lot of fake (read counterfeit brand) bags and watches. Comments: What happened to Xiang Yang market? After that famous "fake" market closed its gates in 2006, many vendors relocated to Yatai Xinyang. 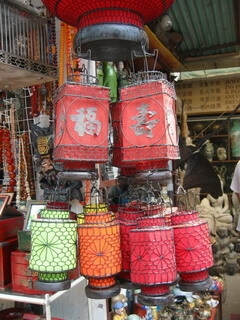 This is a great place to buy inexpensive souvenirs: Shanghai t-shirts, chopsticks, cushion covers and pashminas. Let the buyer beware: when it comes to fakes, you get what you pay for (and you probably paid too much). Description: Outdoor market full of stalls selling the same thing as #4 above. Comments: According to its local ads, the original Xiang Yang market is "now registered as Longhua Market". Well, indeed, after Xiang Yang, the famous "fake" market, closed its gates in 2006, many vendors relocated to Yatai Xinyang above and to the Longhua market. It sells the same items as #4, has the added value of being near the temple, so you could do a bit of sight-seeing before you shop. Description: Three floors of fabric and tailors. Comments: Here you can make your couture dreams come true. Great values are qipaos, cashmere coats and men's shirts. Almost every stall has its own tailor who can whip up whatever you want in about a week. Your best bet is to have something you like copied over in your new fabric. Clothing made from photos or descriptions yield mixed (mostly bad) results. If you can, bring a Chinese speaker with you. Some tailors do speak English. Address: 168 Dongmen Road, not far from Yuyuan Garden. Comments: This market is very similar to #6, but is much quieter and has a lot fewer foreigners standing around looking confused. You'll find the same fabrics - cashmere, silk, linen, wool and cotton at similar prices. Many vendors speak a bit of English but if you're having something complicated made, it's best to take along someone who can speak a bit of Chinese. Description: Crazy maze of vendors selling pets and supplies. The bugs are really the reason to go. Comments: Unless you're in the market for fighting crickets or grubs to feed your birdies, this is more of a gawk-stop than a real shopping trip. It's worth the trip for the weird and unusual and you'll get some great photos. Description: Three floors of all things computer/mobile phone/video/etc. See photo. Comments: This is a great place to pick up bits and pieces such as extra digital camera batteries or memory cards, blank CDs and DVDs, USB memory sticks as well as bigger items such as printers, cell phones, etc. I might avoid the temptation of buying anything too big-ticket (e.g. iPods or computers). If you don't live in Shanghai, and you have trouble with the item, you won't be able to bring it back. Description: Small area of a street with roadside vendors gathered selling Muslim foods and products. Comments: This is an interesting place to see some non-Han Chinese culture. Check ot the different offerings, sample some street food and even have a wander around the mosque. Most of the vendors come from Xinjiang Province and their cuisine is very different from eastern China. Folks are friendly but don't speak a lot of Mandarin - hand signals and smiles are useful. Ask before taking photos. Comments: If you want to get all your tea shopping done in one place, this is it. If you can, take along a Chinese speaker. None available? No problem, allow yourself plenty of time. Arm yourself with a dictionary and go sample tea. Shop owners are extremely friendly. Don't be afraid to touch and smell, ask for tastes. Most will invite you in to have a cup of tea, smell the wares and browse at will. The first two floors are all tea, the third floor is a mix of tea and curios. You'll find everything from Long Jing green tea, Yunnan Province Pu'er tea, jasmine, oolong, everything is here. Comments: If you are like me, you can afford one pair of glasses every few years. You wear them so long that your friends have to tell you that round Harry Potter glasses are really, really out. Those days are over. One trip to the Shanghai Optical Market and you'll have new face furniture for every outfit. Comments: If it's cheap kids' clothing or toys you're looking for, hit this market. Sometimes you have to dig around for sizes and quality but there are some good finds, especially for babies and girls. Some vendors sell brand-name clothing such as Ralph Lauren, Jacadi, Gant, Janie & Jack, etc. Toys are a good bargain here, especially if you need to stock up on little surprises for the airplane. Comments: A great place to order custom-made bedding like those silk duvet blankets at a fraction of what you pay in the Suzhou silk markets. Custom-made sheets and bedding, upholstery fabric are all good value here. Comments: This is the standard "fake" market in Shanghai. There are plenty of sub-par products here and loads of souvenirs. You can stock up on stuffed pandas, brocade table runners, China t-shirts and chopsticks as well as fake Ugg boots, various brands of bags, copy electronics and sports jerseys from just about any team in the world. Bargain hard, the asking prices are outrageous. Comments: Go to see the flower culture of China. Especially during Chinese New Year, the flowers and plants are just amazing.